Just imagine the time of your life when everything was happening right opposite to your planning. Your relationship was not working well, you were facing issues with your finances, your health was also not in great condition, etc. In fact, not only your external situations but internally also you were not doing very great. Nevertheless, at present everything in your life is on the track be it a relationship, job, or finances,etc. and every single day you work on making a better version of yourself. Moreover, when you look back on those old days you realize that having a positive attitude was the only requirement to come out of that negative situation. Well, as can be seen, a positive mindset can be handy even in the midst of a tragedy. You can’t avoid negative situations in your life. These adverse and uncontrollable circumstances are part of life. And in order to be happy, it is essential for everybody to learn to deal with them. Therefore, staying positive in unfavorable conditions is invaluable virtue in leading a joyful life. 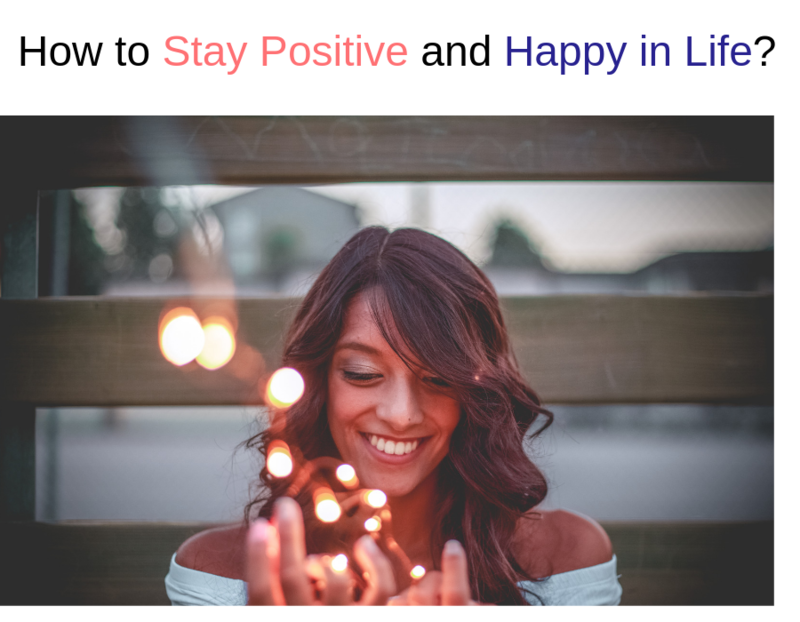 As a matter of fact, in this article, we are presenting you some of the best ways to stay positive and happy in life. Whether you accept it or not but you are the average of 5 people you spend the most time with. Consciously or subconsciously those closest people are influencing the way you look at things in life. For this reason, you should have a company of people who support you, admire you, motivate you and most important provide you with genuine feedback all the time. Usually, a negative person tends to be more controlling in life. He always sees things from his perspective only and when things do not happen as per his expectations, he panics. Therefore, instead of controlling everything you should learn to accept the things as they are and let it happen in its own way. Because as we talked earlier, negative situations are inevitable and pushing yourself in such plights will make it nothing more than worse. The process of pleasing everyone around you results in overthinking. You start to have doubts about your every action such as what if I make someone unhappy, what if I speak in a wrong way etc. So, instead of following your brain too much you should follow your heart. Because thinking too much affects our natural response and which ultimately makes us unhappy in life. You should stop thinking and stop caring too much about people and events in your life. One of the best ways to keep yourself positive throughout the day is to start your day in a positive manner. It could be listening to your favorite song, reading an excerpt from your favorite novel,etc. Because if you fill your head with tons of positivity in the morning itself, it will provide you an optimistic way to look at your problems during the day. And you would be able to solve them without panicking. In fact, before going to sleep also you should read or watch something constructive so that your subconscious mind pack your head with positive thoughts when you wake up in the morning. A very simple yet, a powerful way to boost positivity in your life is to adopt an attitude of gratitude. Spending a few minutes during the day thinking about all the things you are thankful for can tremendously augment positiveness in life. As we all know ‘A healthy mind lives in a healthy body’. You can never be optimistic in your life if your body is not functioning properly. If you are physically unwell, automatically negative thoughts will start popping in your head. Therefore, make a routine to do some physical activity every day and embrace healthy eating style to keep your body and mind well. Whenever you have bad times in life, before discussing it with your friends and family have a genuine conversation with self.Try to analyze what went wrong and how can you take a lesson from this so that if you face such situations againyou can handle it efficiently. The law of attraction is universal. What you send out tend to come back to you. Therefore, give a person lift in your car, help someone giving the information they need,etc. Because of receiving help, the positive vibes which those people send out will boost your positivity and provide you happy feelings in life. We often underestimate the power of a genuine smile in our life. To emphasize, scientifically it has proven that when you smile, the feedback sent from facial muscles to your brain can actually increase positivity even in an adverse situation.Smiling in a negative situation will help you in thinking rationally and increase your overall efficiency. Probably this is the most important tip to be always happy and positive in life. You can never enjoy happiness in life if you haven’t tasted the sadness. Positive cannot exist without the presence of the negative. Therefore, in a tough situation always remind yourself that it is just a phase and it will pass after sometime. Have patience and never give up on a positive attitude in life. In a nutshell, it can be said that it’s not about the negative situations rather it’s your way of handling such circumstances which keeps you positive in life. Hence, you can incorporate any of the above-mentioned tips to outweigh the negatives and be happy all the time.